Poster by student author Hannah Fein. Climate change affects a variety of ecosystems and species, as seen in the previous sections. When temperatures begin to rise, we see phenomena including glacier retreat, increasing disease risks, and altered migration patterns. Another affect, the urban heat island, is described in this student created poster. 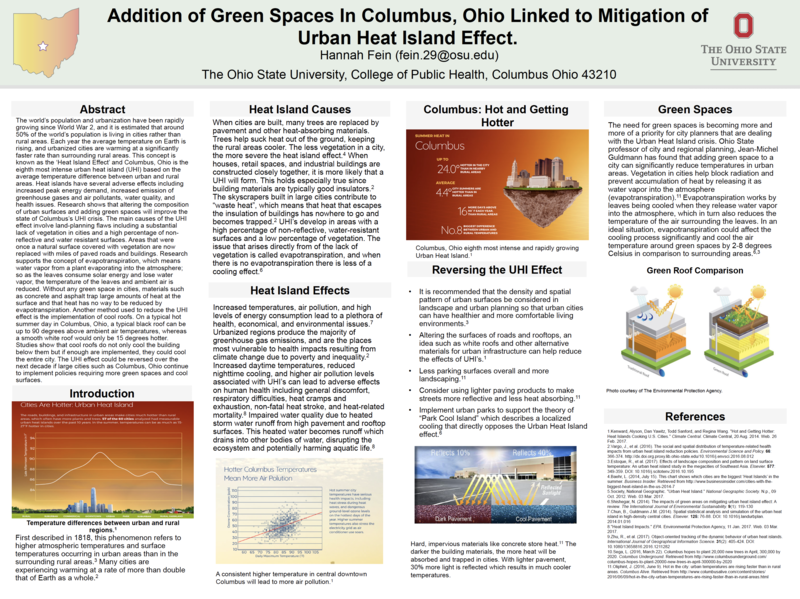 Read the entire transcript of the poster below to learn more about the urban heat island effect in Columbus, Ohio. The world’s population and urbanization have been rapidly growing since World War 2, and it is estimated that around 50% of the world’s population is living in cities rather than rural areas. Each year the average temperature on Earth is rising, and urbanized cities are warming at a significantly faster rate than surrounding rural areas. This concept is known as the ‘Heat Island Effect’ and Columbus, Ohio is the eighth most intense urban heat island (UHI) based on the average temperature difference between urban and rural areas. Heat islands have several adverse effects including increase peak energy demand, increased emission of greenhouse gases and air pollutants, water quality and health issues. Research shows that altering the composition of urban spaces and adding green spaces will improve the state of Columbus’ UHI crises. The main causes of the UHI effect involve land-planning flaws including a substantial lack of vegetation in cities and a high percentage of non-reflective and water resistant surfaces. Areas that were once a natural surface covered with vegetation are now replaced with miles of paved roads and buildings. Research supports the concept of evapotranspiration, which means water vapor from a plant evapotranspiration, which means water vapor from a plant evaporating into the atmosphere; so as the leaves consume solar energy and lose water vapor the temperature of the leaves and ambient air is reduced. Without any green space in cities, materials such as concrete and asphalt trap large amounts of heat at the surface and that heat has no way to be reduced by evapotranspiration. Another method used to reduce the UHI effect is the implementation of cool roofs. On a typical hot summer day in Columbus, Ohio a typical black roof can be up to 90 degrees above ambient air temperatures, whereas a smooth white roof would only be 15 degrees hotter. Studies show that cool roofs do not only cool the building below them but if enough were implemented, they could cool the entire city. The UHI effect could be reversed over the next decade if large cities such as Columbus, Ohio continue to implement policies requiring more green spaces and cool surfaces. Columbus is the eighth more intense and rapidly growing Urban Heat Island.1 Up to 24 degrees hotter in the city than in nearby rural areas. On average 4.4 degrees city summers are hotter than rural areas. 26 more days above 90 degrees F each year than rural areas. Number 8 biggest difference between urban and rural temperatures. Figure showing a dark pavement reflecting 10% of sunlight and a cool pavement reflecting 40% of sunlight. Hard impervious materials like concrete store heat.11 The darker the building materials, the more heat will be absorbed and trapped in cities. With lighter pavement, 30% more light is reflected which results in much cooler temperatures. The need for green spaces is becoming more and more of a priority for city planners that are dealing with the Urban Heat Island crisis. Ohio State professor of city and regional planning, Jean-Michel Guldmann has found that adding green space to a city can significantly reduce temperatures in urban areas. Vegetation in cities help block radiation and prevent accumulation of heat by releasing it as water vapor into the atmosphere (evapotranspiration).11 Evapotranspiration works by leaves being cooled when they release water vapor into the atmosphere, which in turn also reduces the temperate of the air surrounding the leaves. In an ideal situation, evapotranspiration could affect the cooling process significantly and cool the air temperate around the green spaces by 2-8 degrees Celsius in comparison to surrounding areas.3,6 Figure showing a green roof comparison with a traditional roof and a green roof courtesy of the Environmental Protection Agency. Keyword, Alyson, et al. Hot and Getting Hotter: Heat Islands Cooking U.S. Cities. Climate Central, 20 August. 2014. Vargo, J. Et al. (2016). The social and spatial distribution of temperate-related health impacts from urban heat island reduction policies. Environmental Science and Policy. 66: 366-374. Estoque, R., et al. (2017). Effects of landscape composition and pattern on land surface temperature: An urban heat island study in the megacities of Southeast Asia. Elsevier. 577: 349-359. Baehr, L. (2014). This chart shows which cities are the biggest heat islands in the summer. Business Insider. National Geographic Society. Urban Heat Island. 9 October 2012. Shishegar, N. (2014). The impacts of green areas on mitigating urban heat island effect: A review. The International Journal of Environmental Sustainability. 9(1): 119-130. Chun, B. And Guldmann, J.M. (2014). Spatial statistical analysis and simulation of the urban heat island in high-density central cities. Elsevier. 125:76-88. Heat Island Impacts. Environmental Protection Agency. 11 January 2017. Chu, R. Et al. (2017). Object-oriented tracking of the dynamic behavior of urban heat islands. International Journal of Geographical Information Science. 31(2):405-424. Sega, L. (2016). Columbus hopes to plant 20,000 new trees in April, 300,000 by 2020. Columbus Underground. Oliphint, J. (2016). Hot in the city: urban temperatures are rising faster than in rural areas. Columbus alive.